Netflix Steals Super Bowl LII: Game Changer or Trick Shot? This year’s NFL Championship Final was a superb piece of entertainment. An enticing, high scoring game between the underdog Philadelphia Eagles and the NFL’s dominant team, the New England Patriots. The result of the match was certainly an upset with the Eagles beating the odds to emerge victoriously. But arguably the most shocking moment of the night occurred during the half-time commercials when Netflix premiered the first - and presumably only - trailer for the previously unannounced “The Cloverfield Paradox”. In a bold and unprecedented play, the streaming behemoth reduced the typical movie release cycle of several months of building hype and awareness between announcement and release to just a couple of hours. Indeed, the Netflix trailer was less a piece of promotion than it was a call to action with the 30 second TV spot culminating with the tagline “Coming Very Soon” and the revelation that the prequel to 2008’s “Cloverfield” would be available immediately on the streaming platform after the Super Bowl. However, was this a case of Netflix tearing up the Hollywood playbook once and for all or was it a publicity stunt designed to show that Netflix itself could compete with Hollywood heavyweights during one the world’s most crucial promotional events? 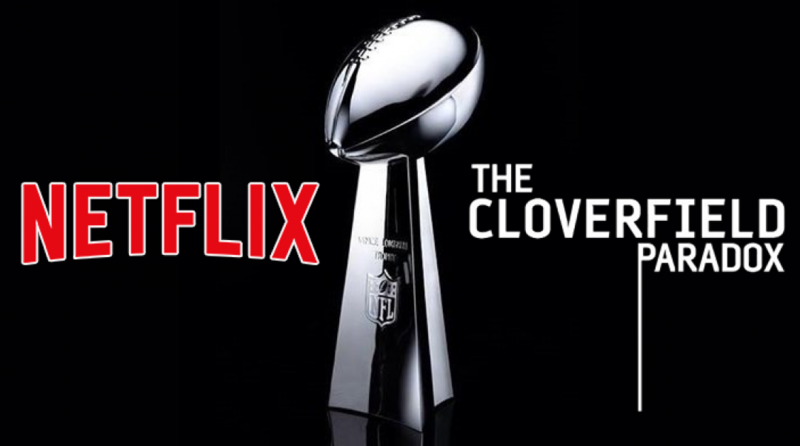 While the trailer for the Cloverfield prequel had been expected to make its debut during the Super Bowl, very little was known about the actual film (even its official title had yet to be confirmed) or what Netflix’s intentions were for it. The rumour was that Netflix had secured the rights to the film from Paramount in January this year and was expected to release it in April for presumably a simultaneous release on the platform and in cinemas. Of course, this would have put “The Cloverfield Paradox” in direct competition with the considerably more anticipated “Solo: A Star Wars Story” and HBO’s “Westworld”, both expected to make their promotional debuts during the Super Bowl and to occupy a similar release window of April/May. For a decidedly more niche franchise like Cloverfield, this would have made for an uphill struggle for attention against such fierce competition. However, Netflix’s Hail Mary of a near simultaneous release of both the teaser and the product itself produced a startling result in terms of mentions on Twitter. 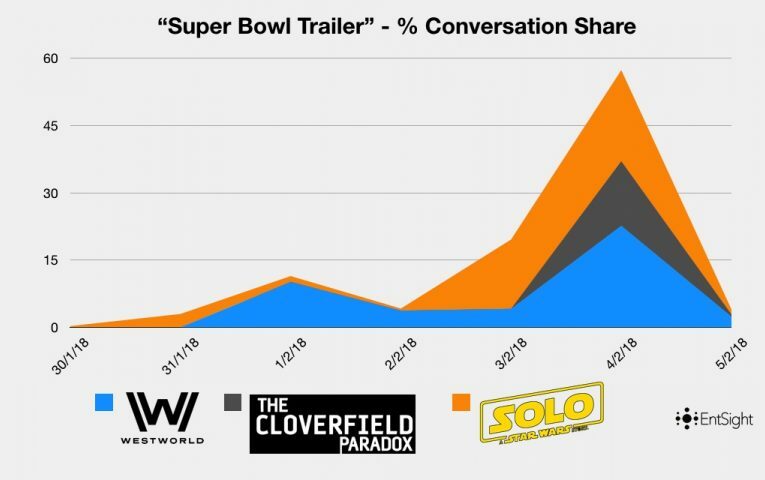 What is more astonishing is “The Cloverfield Paradox” went from a standing start compared to its rival titles, which were already garnering a considerable volume of mentions in the lead up to the Super Bowl, to comfortably sit between the two with its conversation share. In terms of getting eyeballs on its new title, Netflix’s unorthodox release strategy had proved just as winning and unconventional as the Eagles’ quarterback Nick Foles’ already legendary touchdown catch. Netflix was likely counting on these key influencers to spread the word, who would have been eager to drive the conversation around such an unprecedented occurrence. Ironically, though, Netflix’s immediate release of “The Cloverfield Paradox” had essentially usurped the critics and commentators. With no pre-release screenings and so little time between the first glimpses of footage and viewers being able to view the film in its entirety, Netflix reached out directly to audiences to make up their own minds. This was undeniably in Netflix’s best interests in ensuring maximum audience enthusiasm for “The Cloverfield Paradox” as the hasty response post-release from critics to the film was a decidedly negative one with an aggregate score of just 20% on Rottentomatoes.com and 36 on Metacritic.com. Even more significant, it was not the quality of the film which was driving the conversation around “The Cloverfield Paradox”. 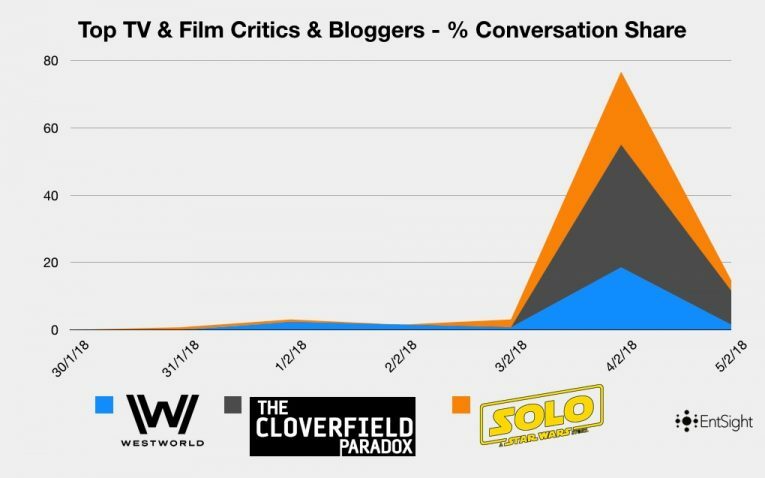 We can see from the word cloud above generated by top critics and bloggers that it was the surprising release strategy of “The Cloverfield Paradox” that was driving the conversation, with keywords such as “watch”, “release”, and “surprise” appearing as some of the most prominent. So, despite critics and bloggers being underwhelmed by the film itself, their focus was squarely on its surprise release, essentially making their views on the film irrelevant in the immediacy. It was highly likely that Netflix was aware “The Cloverfield Paradox” would receive a muted response from critics and audiences. The film had been bounced around the release schedule since last February with Paramount unsure of either its optimum release date or how to market it. This is most probably because it was originally supposed to be a stand-alone film entitled “The God Particle” before it converged into the Cloverfield franchise, a factor that is fairly apparent in the criticism of the film. Whether or not Netflix would have adopted a more traditional release cycle for “The Cloverfield Paradox” had the streaming service had more confidence in the product is something only known to Netflix themselves as it likewise only known to them whether they will pull this stunt again. What is certain, however, is this most unconventional strategy gave Netflix as a service incredible optics during the Super Bowl. What comes through loud and clear from the word cloud above, generated by audience response to the Cloverfield trailer, is Netflix’s core message of immediacy with the word “Tonight” being most prominent alongside the Netflix brand. This means Netflix essentially co-opted one of the world’s most-watched entertainment events and leveraged it into making a piece of platform’s own content into appointment based viewing. For a service that is synonymous with being “always available whenever you are”, this would have made audiences instinctively want to make themselves available for Netflix straight after the game to join in with the rapidly growing conversation around the surprise release. As a result, the argument that “The Cloverfield Paradox” teaser was more of an advertisement for Netflix rather than the actual film is an extremely strong one, with the word “Cloverfield” appearing much less prominently than the service’s brand name. The trailer signified the virtues of the platform’s expediency far more than it extolled the virtue of the film it was supposed to be promoting and the audience conversation mirrors this concisely. Ultimately, this was a guerrilla warfare-style strike in one of the most competitive advertising battlegrounds in entertainment which cements Netflix’s reputation as a major disruptor in not only the distribution of media, but now in the promotion of it as well.